Sonic Producer V2.0 Beat Maker: What is Affiliate Marketing? Affiliate Marketing is a revenue sharing business model usually between an online merchant and a website owner. The website owner agrees to place an advertisement or text link on their website in exchange for a commission if the visitor that clicks through to the merchant's site purchases something. 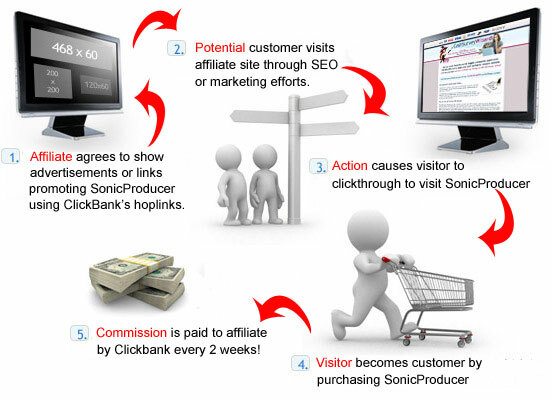 In our case, you will be promoting Sonic Producer through your own website, article marketing, pay per click marketing, SEO, or some other method to generate visitors to SonicProducer.com. If those visitors purchase the program, you get a full 70% commission for each sale you deliver! Affiliate marketing is one of the best and most lucrative ways to earn money online. Test is out, we have extremely high conversions with dozens and dozens of happy affiliates! Check out the diagram below to get the big picture of how affiliate marketing works.